What Are the Benefits of Spray Tanning Over Other Types of Tanning? What to Look for When Buying A Spray Tan Machine? There are many choices when it comes to achieving the perfect tan. One of the most popular and safest ways to get a bronzed glow is by getting a spray tan. This technique has many benefits when compared to other tanning options. In the past, most types of sunless tanning would result in looking like an oompa loompa, including spray tanning. Thankfully, those orange hues have been left in the past. Now with advances in the tanning solutions and innovations in spray tanning machines, a natural looking tan is easy to achieve. All without having to expose yourself to harmful UVA/UVB rays. You don’t even have to go into the salon anymore to maintain your tan. The best spray tanning machines are now mobile, lightweight, and easy to use in your home. This brings the salon right to the comfort of your own home, or practically anywhere you desire. In this post, we will dive deeper into the world of spray tanning machines. We’ll also discuss why spray tans are so popular, the different types of machines, what to look for when you are buying your own, and even some application techniques and tips thrown in. By the end you will feel like an expert on spray tanning machines and be able to choose which option is best for your needs. You may be wondering: Why should I use a spray tan machine? Well, there are many benefits of spray tanning over other forms. When compared to other sunless tanning options, such as lotions or mousses, spray tanning typically results in less streaks and more even coverage. As long as the product is applied correctly and the best spray tanning machines are used, more natural results are seen than with other self-tanners. Spray tan machines are also less messy than other sunless tanners. Other tanners can take hours to dry, giving them the opportunity to rub off on furniture, clothing, and sheets while the color develops. Spray tans needn’t be like this. In addition, spray tans offer you the ability to customize your unique shade, while other options usually only offer a few shades. 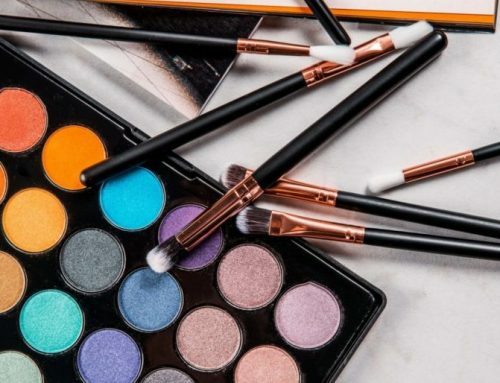 Having a range of options allows you to easily control how light or dark bronze you wish to be to find the shade that is most flattering to your skin color. With the new portable designs, there is now the option to spray tan at home. Using a spray tan machine allows you to take away the hassle of having to go to the salon. The new innovative spray tanning equipment is lightweight and very beginner friendly. This makes it ideal to use in your home whenever you want to look like you just took a trip to the islands. Home spray tan machines are convenient for anyone with a busy lifestyle. Spray tanning also allows you to avoid unnecessarily exposing your skin to the harmful effects of the sun for long periods of time. The use of a spray tanning machine offers you a safe option to achieve a gorgeous tan, without damaging your skin or risking skin cancer. According to aimatmelanoma.org, both tanning and burning are signs of skin damage that are results of exposure to ultra violet radiation. They go on to say that a tan is your skin cells reacting to the radiation in an attempt to protect themselves. The cells essentially send a signal to produce more melanin, the chemical in skin cells that causes your skin to darken. The increased melanin is meant to help protect the DNA in your skin cells to avoid further damage. Read more about it here. UV radiation can also affect more than just your skin. It can cause serious damage to your eyes as well. To learn more about this, look at what the CDC has to say about intentional UV tanning. By avoiding UV rays, spray tanning is safer than both indoor tanning beds and outdoor tanning. Needless to say, avoiding the harmful rays that the sun emits is one of the biggest benefits of getting your glow by using a spray tan machine. It is not only convenient, provides great results, and is less messy, but it could help save your life. Now that you know what all the benefits are, it is time to learn about the different types of spray tan machines. Each type of machine has their own pros and cons. This means one may be better for your lifestyle and tanning routine than another. This type of spray tanning machine is the most popular. HVLP spray tanning machines are used by salon professionals and beginners alike. The design of these systems is similar to those that are used to paint houses and cars. This makes it very beginner friendly and easy to control. The lightweight design and portability of this type of spray tanning machine, is another reason why it is so popular. HVLP machines are well known for not over spraying your tanning solution, saving you money in the long run. They also tend to be much quieter than other types of machines available. It is easy to cover large areas quickly and evenly, resulting in a beautiful and streak free tan. They are also one of the least messy spray tanning machines, as it is less likely to leak. Which is always a plus when you are tanning in your home. Although these machines have the phrase “low volume”, they are actually one of the loudest types of spray tanning machines available. That is due to the extra fans that are in the turbine. LVLP systems are not our recommended choice for beginners. Using these types of machines to achieve a flawless spray tan involves the precision that can only come with experience and skills since they disperse a low volume of tanning solution. That is why these are usually used in salons, instead of personal, in home use. They are also usually more costly than other models. It provides fast results, though not as fast as the HVLP machines (15 minutes compared to 6 minutes), when used correctly. They generally operate around 1 psi whereas HVLP machines use anywhere between 4 and 10 psi. This means much less tanning solution is dispersed at a time and is why it takes longer. The lower dispersion rate allows the user to be much more artistic in the application of the tanning solution. 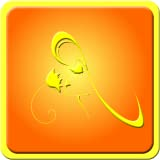 But as we said, it also requires more skill and experience to get good results. Airbrush spray tanning systems work in a similar way to the machines that are used to create children’s airbrush tattoos. The difference is that the compressor has been modified to release product to be evenly distributed over your body. It takes advantage of high pressure to deliver a large amount of product at one time. Unfortunately, this high pressure can sometimes result in over spraying and wasting a lot of tanning solution. Which equals wasting money and creating a mess, and we are not about that! Other things to note about this type of spray tanning system is that they are a very common type both when used at home and in the salon. This is due to their design of being more quiet and economical than LVLPs. Each session can take between 25-45 minutes depending on your unique body type. Now, these systems are not ones that you would generally purchase for mobile or at home use, since they have to be installed by an experienced professional. That is why they are almost exclusively found in salons, but we thought they were worth mentioning since it is a type of spray tanning machine. These booths look similar to a shower stall. Inside are a bunch of nozzles that, when turned on, spray the tanning solution evenly over the body. This offers complete privacy while you are getting your bronze on and it only takes two minutes! The downside is, these booths are usually not as accurate as using other machines. You will often need touch ups in areas that the nozzles could not reach. This seems unfortunate since it is such a pricey option to begin with. Some spray tanning machines tend to be pricey. So, it is important to look for the right features when looking into buying a machine. You will want to purchase a long lasting, durable machine that gives you a gorgeous, even tan. 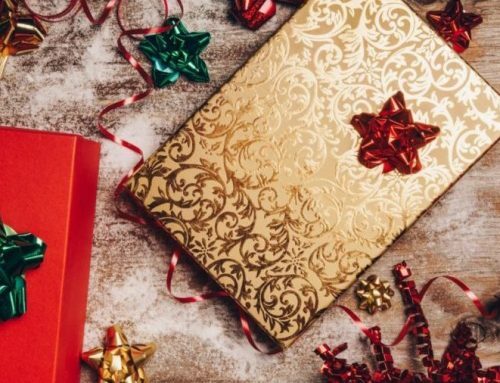 Before you invest your hard-earned money, take the time to ensure that you are purchasing a quality product, with the features that are important to you. Durable Materials: There are many different materials that machines can be made out of, but if you want yours to last look for sturdy and reliable engineering and design. Pass on machines that are made of cheap plastics. Seek out ones that are made of durable materials that will last you a long time, and a lot of tans. Adjustable Nozzle: An adjustable nozzle is key to achieving a precise and even tan. The nozzle is what gives you the control to adjust the size of the area that you are spraying. This will come in handy when you are switching from different sections, like your arms to your back. Pressurized Cup: When looking at different tanning machines, keep in mind, a pressurized cup is essential for a streak-free tan. The cup holding your spray tanning solution should be pressurized, as this will help the color distribute evenly across your skin. This will also help to avoid any beading, or droplets of tanner, that may appear on the skin. Cup Size: You may also want to consider how much spray tanning solution the cup can hold. This will determine how often you will need to refill the cup. Some are able to hold enough solution for many tans and others need to filled again after each application. If you are a frequent tanner and will be using your machine regularly, look for a larger cup to cut down on how many times you have to refill it. Noise Level: Some of these machines can be very loud. Although this may not be a concern to everyone, it can be a surprise to some first-time spray tanners. This is often mentioned when reading reviews about spray tanning machines. Remember LVLPs are typically the loudest, while HVLPs are known to be the quietest. Cleaning: We recommend looking for a model that is easy to clean and resistant to clogging. Look for machines that are easy to take apart to clean. This will make caring for your machine a breeze and help you to prevent any clogging of the product. Mobility: Again, this may not be a concern for everyone, especially if you are looking to purchase a new model for your salon. But if you are looking for spray tanning equipment for home use or for your mobile business, portability is an important quality to look for. Make sure the machine is easy to use and store, keeping size and weight in mind while you are shopping. Warm Air: This is considered more of a “luxury” feature but is a nice added bonus. Most spray tanning machines feel cool to cold when applied to the skin. To avoid this blast of chilly air, look for this feature to make you more comfortable. You will certainly appreciate it in the colder seasons. Exfoliate: Removing the dead skin from your body will give you a “clean slate” to work with and allow the tan to sit better on your skin. This will allow the tan to not cling to any dry areas and apply evenly, reducing splotches. 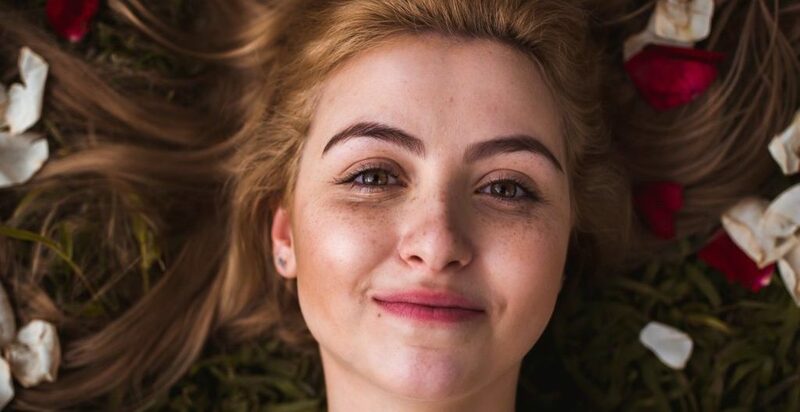 When choosing an exfoliator look for one that is oil-free. The oils could prevent the tanning solution from soaking into your skin. No Deodorant: Now we are not suggesting that you give up deodorant forever, just for when the spray tan is being applied. The chemicals found in most deodorants can react with the spray tan and turn your underarms temporarily green. The goal of a spray tan is a bronze glow, not to look like the Grinch. “What do you mean you don’t want to look like me?” – To avoid Grinch-looking armpits, don’t wear deodorant when spray tanning! Protect Your Hair: When you are applying your spray tan, be sure to cover your hair. We suggest putting your hair into a shower cap to ensure that it is completely covered. Don’t forget about your eyebrows! Apply a thick layer of moisturizer to prevent the tanner from absorbing into your brow hair. Moisturize: Even the most professional spray tanning machines and the best spray tanning solutions cannot make up for poorly hydrated skin. You need a thin layer of moisturizer to ensure that your dry patches will not appear splotchy. This means paying special attention to your elbows, feet, heels, and hands. Start from The Bottom & Work Your Way Up: When using a spray tanning machine, excluding an automatic tanning booth, start the application process from your feet and then work your way up your body. Be sure to hold the device two to six inches from your body, depending on the machine being used, and apply the tanning solution in even layers. Less product will be needed on areas that are more absorbent, such as feet and ankles, than areas like arms and legs. Then work your way up to your torso, spraying the front and the back of your body. Start in the middle and then move to work on each side. We then suggest to work on the arms. When spraying the armpits and wrists, use a light layer. The area between your breasts will also need less product applied, as it is a super absorbent area. When using spray tan on the face, work in small sections and use light layers. 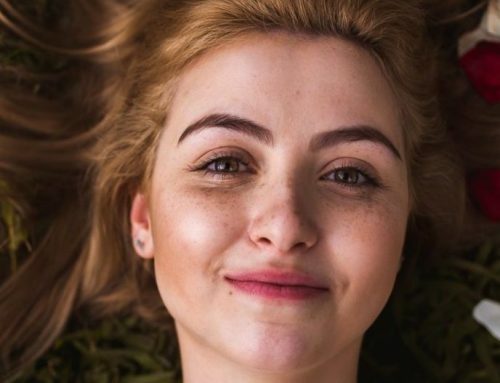 If your face or any area looks blotchy, it is a simple fix. 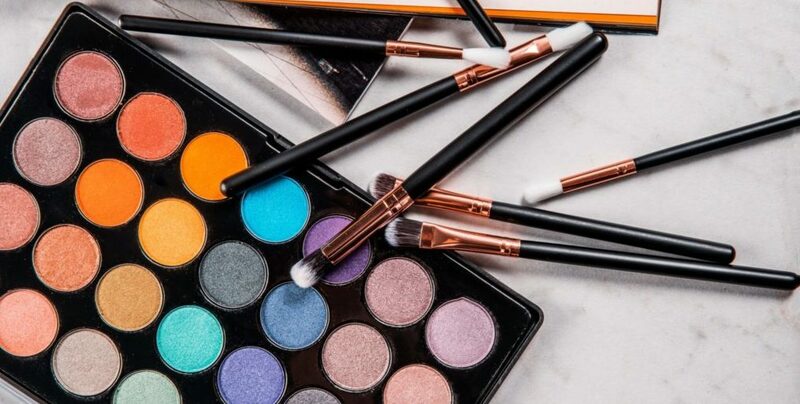 Before the product dries, quickly blend it out with a tightly packed makeup brush, such as a kabuki brush or a buffing brush. Don’t Forget Your Nails: To keep your nails from turning bronze, make sure to wipe the nails with a clean cloth after application of your spray tan. After Spray Tanning: Once you have dried, let yourself relax in loose dark clothing. This will avoid any accidental rubbing off of product. Wait about six to eight hours before showering to let the color develop. What If One Area Looks Too Dark? If any area appears too dark after you have showered, don’t worry we have an easy fix to keep you looking flawless. Use lemon juice on the darkened area. The acid from the lemon juice will help to tone down the darkness. Now that you are an expert when it comes to spray tanning machines, it is time to choose the best spray tan machine to buy for you and your lifestyle. Keep reading to find the perfect machine for you. 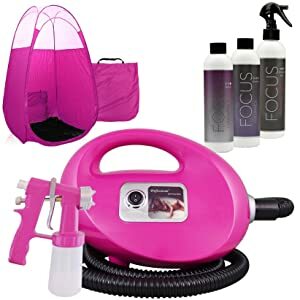 Editor’s Choice: Black Fascination FX Spray Tanning Kit with Tanning Solution Pack & Tent (click to check latest price on Amazon). The Black Fascination FX is a perfect choice for beginners and professionals. This spray tanning machine is a HVLP, making it easy to use, very efficient, and quiet. It is constructed of durable materials and will last you through many tans. The nozzle features adjustable spray patterns and a fluid control knob, to make getting a gorgeous bronzed color simple. 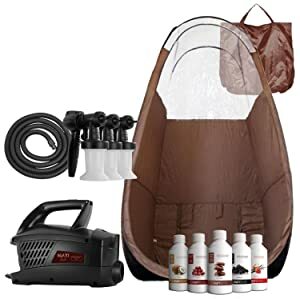 This kit includes an extra-large pop up tent, spray gun, 8-foot hose, tanning solution, and developer. This lightweight model is one of the best spray tanning machines available. 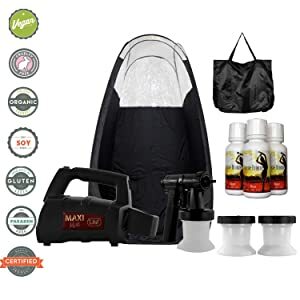 Maxi-Mist Lite Plus Sunless Spray Tanning Kit (click to check latest price on Amazon). 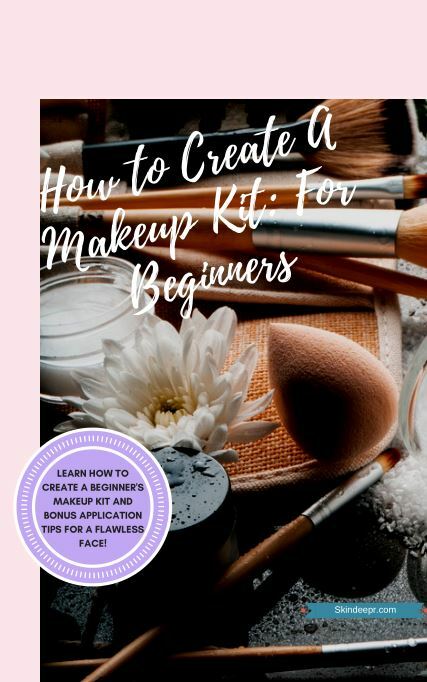 If you are just starting out, this kit may be perfect for you. Everything that you need to get started on your spray tanning journey can be found in in this Max-Mist Lite kit. It includes the spray gun, a pop-up tent with a “clear view window”, spare parts, extra solution cups, and samples of Tampa Bay Premium Solution in light, medium, and dark! The spray gun is designed to adjust in two patterns, horizontally and vertically, to make bronzing every inch beautifully simple. The solution cups are designed to ensure that no product is wasted and that there is no messy over-spraying. The only con to this spray tanning machine is that it is on the louder side, but reviewers say that a blender is louder. 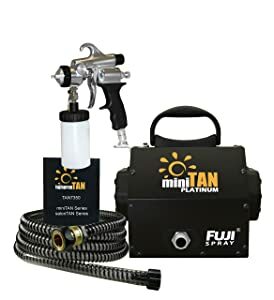 Fuji Mini Tan M Model HVLP System (click to check latest price on Amazon). This tiny model is very powerful and is one of the top rated professional spray tan machines available. This HVLP machine is very quiet due to its noise reducing filter covers that draw air from the rear inhibiting a direct path of sound. This lightweight, mobile machine offers full control with adjustable spray patterns and fluid control. Although it is compact in size, it is durable and great for the frequent tanner. It is no surprise, since Fuji has been one of the most well-known name sin the tanning industry for the past ten years. MaxiMist Allure Xena Sunless Spray Tanning Kit (click to check latest price on Amazon). The MaxiMist Allure Xena is a stylish model with a metallic black and gold design. But it isn’t just pretty to look at, this machine also helps deliver a flawless spray tan. This HVLP spray tanning machine is beginner friendly and easy to use. This model is very quiet because of its noise reducing design. It also has a bonus blow drying setting. This German engineered device sprays in multiple patterns, with fine and precise flow control. It also features clog free performance. The Xena tanning kit comes with a two-year warranty and two extra spray heads. Spare parts are also included, giving you even more peace of mind if something happens to go wrong. 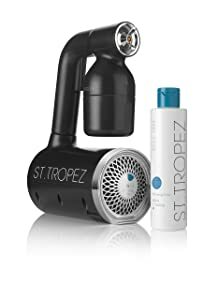 St. Tropez Pro Light Spray Tanning Kit (click to check latest price on Amazon). St. Tropez is a premium tanning brand and one of the most distinguished names in the tanning industry. This makes it is no surprise that they would manufacture one of the best spray tanning machines. This sleek and lightweight device delivers a professional spray tan at home. It uses micro-whirlwind technology to distribute a continuous stream of air and heat to seal the solution for a flawless tan. It is easy to clean and reduces over-spraying. This kit comes with the St. Tropez bronzing solution and their technique guide to help you achieve a natural and streak free tan. The included bronzing product provides a natural finish without parabens or sulfates, making it one of the best tanning solutions! Pink Fascination FX Spray Tanning Kit (click to check latest price on Amazon). 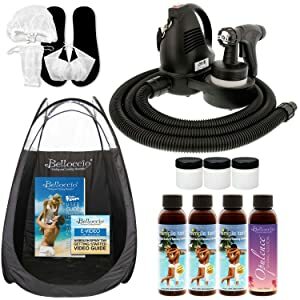 Complete Belloccio Premium Professional Sunless Spray Tanning System (click to check latest price on Amazon). Belloccio offers this beginner friendly tanning system that offers all the basics, it even has an online guide to make home use easier. It features an HVLP turbine system with a two-year warranty to ensure it will last you through many tanning sessions. A pop-up tent and carrying bag is also included. Although there are no bells and whistles with the machine, it will get the job done to give you a gorgeous and even tan. It also includes with a variety pack of four different tanning solutions. 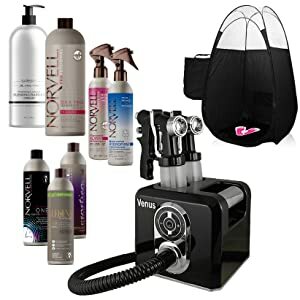 Norvell Sunless M1000 Mobile Spray Tanning Machine (click to check latest price on Amazon). Norvell is another popular name in the tanning world. This HVLP spray tanning machine is portable and lightweight, making it easy to provide professional salon quality anywhere. The nozzle has adjustable spray patterns and helps to reduce over-spraying. This model is also a great price, when compared to other Norvell spray tan machines. It is an excellent choice for those that are heavy tanners and want to bring the salon experience to their home. 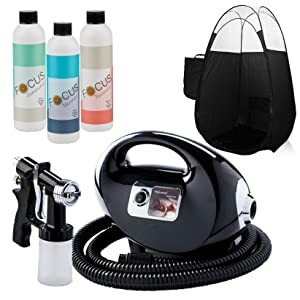 Black Venus Elite Spray Tanning Kit (click to check latest price on Amazon). The Black Venus Elite features innovative spray tanning technology to give you tropical glow, without having to sit in the sun. It is a HVLP model that has a quiet and efficient motor. This spray tanning machine applies an even and streak free layer of tanner. The durable metal nozzle is easy to adjust to different spray patterns. The solution cup is removable and also has a washable air filter. This makes cleaning easy, which reduces chances of the machine clogging. It also features an LED indicator light, speed control, an auto heat function, and recessed spray gun holders. The kit also includes tanning solution, a pop-up tent, carrying bags, firming lotions, developers, and more. This spray tanning kit comes with all the bells and whistles! MaxiMist Evolution TNT Spray Tanning Complete Kit (click to check latest price on Amazon). This complete kit was designed specifically for salons or mobile techs that require dependability, performance, and durability. The quality is professional but the machine is still easy enough to be utilized for personal use. The solution cups are optimized for solution atomization to reduce over-spraying and wasting product. The needle featured in the nozzle is designed to eliminate build up and corrosion, which lowers the risk of clogging. It also includes three spray heads, a pop-up tanning booth with a clear view window, five sunless tanners, a spare filter, and one-year warranty. If you are looking great for a professional spray tanning kit, this is a great option! 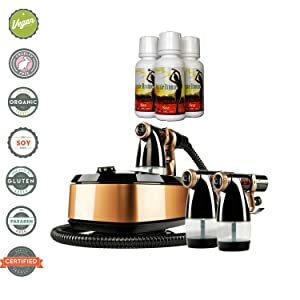 You have all the tips and tricks, the information on what to look for, and choices of the best spray tanning machines to buy. Now all you have to decide is, how bronzed do you want to be? Let us know in the comments below which of these top spray tanning machines you’re going to use to get your tropical glow. Our favorite is the Black Fascination FX.